Ladies, let's talk about the elephant in the gym - weight training. It always seems so daunting. Especially when you are in the gym. I mean, come on. You're just doing your cardio on the treadmill, and you look over where the scary weight machines and free weights are. You think, well, someday I'll venture over there. But not today. Mostly because the men intimidate you, is my thought. At least, that's how I feel. Today I'm gonna give you FIVE (count 'em!) good reasons why you should take the leap and start lifting weights. But let's step back for a second and boost our self-esteem a bit, first. You know (or you will teach yourself) exactly what you are doing. Even if you really don't know what you are doing, just act like you do. No one will notice! Okay. Now we can move on to those five reasons why you should begin lifting weights! Numero uno: Weight training boosts your metabolism. Like crazy. According to the December 2013 issue of Women's Health magazine, "two months of resistance training twice a week increases resting metabolic rate by 7 percent." And that's only with two days of weight training! What this means [to me] is that if you weight train, you will naturally burn more calories when you are sitting around doing absolutely nothing. 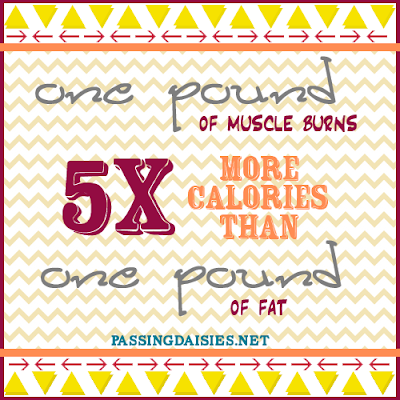 Numero dos: Weight training will help burn more calories. 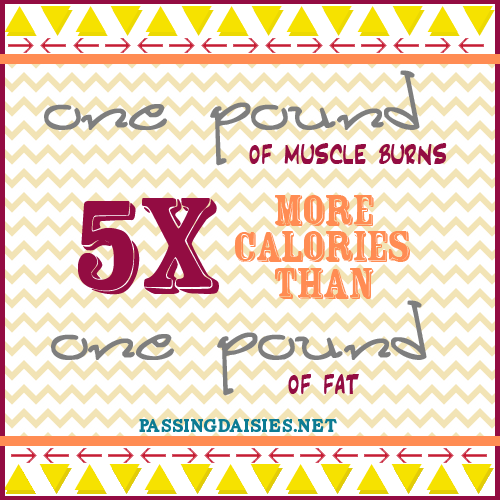 A pound of muscle burns FIVE TIMES more calories than a pound of fat. So if you want to lose weight, pumping iron is a KEY component to your workout! Numero tres: Weight training builds muscle. Numero quatro: Weight training creates a sculpted body. Even though I haven't been lifting weights as often as I should be, I can already tell a difference in my arms from my brief lifting. I love looking in the mirror and flexing my meager arm muscles, watching as a small little "bump" appears where my biceps are located. And touching your muscles makes you feel really proud of what you've accomplished. It sounds cheesy, but it does. If you want to see the results of your lifting, all you have to do is look in the mirror and see the toned body you are creating. It feels great! Numero cinco: Weight training makes you proud. Ladies, my point is this: START LIFTING WEIGHTS IN THE GYM. Even if you are intimidated. It's good for you. And if you still don't want to pursue this in the gym, then buy some weights and start working out at home. There are tons of great workout plans you can find online! Good. Now get out there and kick some booty.